Cannot be used rear facing or with children weighing less than 20 pounds. Is fairly heavy (26 pounds) as a result of steel frame, thick foam, and other features. In-between leg strap has been cited by some parents as being hard to position. The Graco Nautilus 3-in-1 Car Seat is one of the best convertible car seats on the market, and as you will see later, gets amazing reviews on Amazon. This car seat will protect your child for years, as it adjusts as your child grows! The weight limit starts at 20 pounds (so don’t use it for your newborn), but the limit extends until your child weighs 100 pounds. Once your child weighs above 30 pounds they may switch to using this car seat as a highback booster seat (no harness) until they weigh 100 pounds. Your child should also be between 38 and 57 inches tall. This seat features contoured armrests, as well as a cup holder and storage pockets to help keep drinks and other materials close by. Finally, the Graco Nautilus 3-in-1 Car Seat can be adapted and used as a backless booster seat when your child weighs between 40 and 100 pounds, and is between 40 and 57 inches tall. When the seat is used like this there is no harness and no back support. Once children are above 57 inches and weigh more than 100 pounds, they should stop using this seat. Keep in mind that these 3 intervals overlap, meaning you do not have to adjust the seat right when your child reaches the weight and height minimum. In fact, thanks to the extended 5-point harness system, children can remain harnessed until they weigh 65 pounds. The American Academy of Pediatrics recommends that children in front-facing car seats should use a 5-point harness as long as possible, and this seat offers you just that capability. 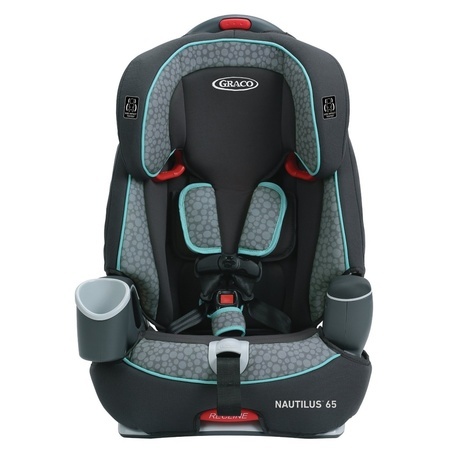 Looking at safety features, you will see that the Graco Nautilus 3-in-1 Car Seat offers plenty. To start with, the seat features a steel-reinforced frame that boosts both strength and durability. Thick EPS foam is incredibly energy absorbent. This seat is both side-impact and crash tested. 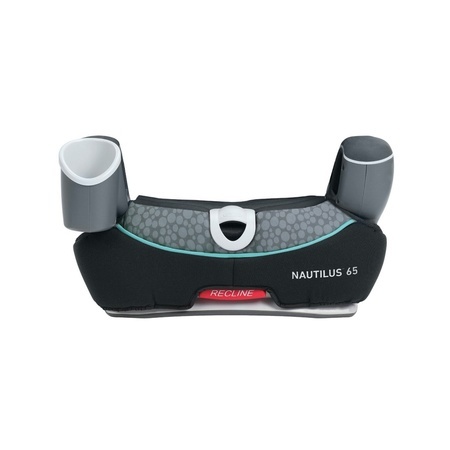 The Nautilus meets or exceeds rigorous US safety standards, and in fact is side-impact tested for occupant retention from the 5-point harness alone. This seat features open-loop belt guides that will help you properly position the seat using your vehicle’s seat belt. As noted earlier, you never have to rethread the straps when repositioning the harness. Finally, the seat cushion is removable and machine washable, making it incredibly easy to clean. Simply put: parents love this car seat. This model is currently the Amazon #1 best seller of forward facing child safety car seats. There are currently a few thousand reviews reviews logged on this product, with more coming in each day. This is a product that has been on the market for several years, but remains one of the most popular and sought after car seats due to its positive reviews and affordable pricing. Thousands have commented on how easy the seat is to use: both to install the product and to adjust it to fit their child’s needs. Because this seat has been available for years, parents are raving that their seat has held up for years. The seat is durable, and the cushion is washable: a major plus for parents when buying any product for their child. Many parents have also noted that their children are always very comfortable in this car seat and also frequently use the cup holder and storage pockets for holding small toys and other items. One complaint to note regards the leg strap of this car seat. Many parents have noted that this is too short and can be difficult to use. However, one parent notes that as the child grows to a larger setting on the 5-point harness you may remove the body support and also move the leg strap to the second position, giving you much more space. As always, check your manual and always follow height and weight limits when determining the right positioning for your child. 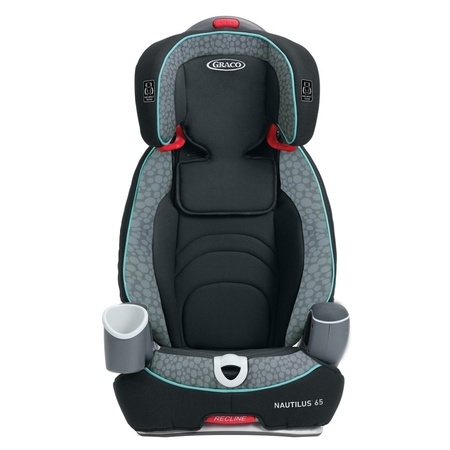 The Graco Nautilus 3-in-1 Car Seat is a solid choice for any parent looking to buy a car seat that can be used for several years, as this seat can be used as both a high back booster and as a backless booster seat. Additionally, the seat is not just versatile, but is also packed with safety features. You can feel confident using this seat as your child grows, and likely will not need to purchase another seat. Finally, the reasonable price point makes it a product accessible to a large variety of parents, especially considering this will be the only product they will need (with the exception of an initial car seat for when their child weighs less than 20 pounds).